A few weeks ago, we reported on the fact that UK-based weight loss organisation Slimming World had removed Porky Lights, a range of supposedly low-fat sausages manufactured by Surrey-based G White & Co, from their approved list after testing indicated that the product was in fact much higher in fat content than claimed. G White & Co heavily disputed their findings, but neither side has since been willing to back down on their claims, and as such the row has continued to escalate. 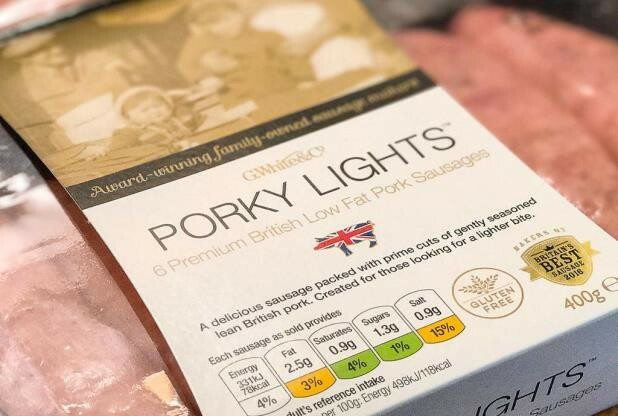 Porky Lights are advertised as containing just 78 calories and 3% fat, which led to Slimming World giving the product a classification of half a ‘Syn’. However, after those at Slimming World became “concerned about the fatty texture” of the product, additional nutritional analysis was conducted. According to Slimming World, their concerns proved to be justified, as the sausages were found to be “much higher in fat than the nutritional information on the product's packaging had indicated”. Following their initial announcement however, Managing Director of G White & Co, Chris Price, fired back. He stated that Slimming World’s results were “highly inconsistent” and “grossly misleading”. He even went so far as to accuse the company of basing their statement on analysis undertaken by a rival manufacturer, rather than conducting their own tests. “We felt it was important to obtain our own test reports because G White & Co, the company who make Porky Lights, were publicly accusing us of relying on sabotaged test results commissioned by competitor companies - in effect suggesting that we were misleading our members and seeking to discredit their company. “The results of the new tests show that the fat content of the sausages varied enormously and none of the sausages we sent for testing were actually low fat. The results clearly show that the average fat content is anything between 8.7g per 100g and 19.4g per 100g - all significantly higher than the 3.8g per 100g fat (or 2.5g fat per sausage) declared on the nutrition information on Porky Lights' packaging. “These results are in addition to the previous test results which we were shown by one of our suppliers, which consisted of eight reports showing average fat contents ranging from 9.6g per 100g to 19.1 g per 100g. “Questions are being raised about the broader methodologies of the food testing processes themselves but G. White & Co stand by the fact that they employ the highest level of food testing available to food manufacturers and repeatedly exceed the testing standards that are required to back up their nutritional claims in order to maintain their stringent quality control. “In order to expedite the process of giving complete and absolute assurance to its highly valued customers and to protect its impeccable reputation, G. White & Co have invited Trading Standards to now step in.